Nepticula auromarginella Richardson, 1890. Ent. mon. Mag. 26: 30. Leaf-miner: A short, twisting irregular gallery with frass filling two-thirds of its width. In exposed leaves the frass is densely packed, whereas in shaded leaves it is thinner (British leafminers). It usually forms distinct dark brown mines, darker than S. aurella and the gallery edges are more conspicuously purple. Egg on the leaf upperside. The mine is an unusually short, not very tortuous corridor with a central line of frass that is irregularly interrupted and takes about 2/3 of the corridor width. Pupation external (Bladmineerders van Europa). Mine of Stigmella auromarginella on Rubus fructicosus agg. The larva of auromarginellais amber yellow, head very light brown. The characteristic pattern of spinulation is depicted by Gustafsson and van Nieukerken (1990a) (Bladmineerders van Europa). 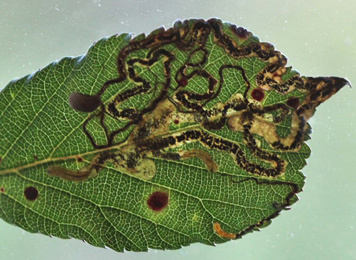 Time of year - larvae: Throughout the year (British leafminers). Distribution in Great Britain and Ireland: Britain including Dorset and South Wiltshire (NBN Atlas).See also British leafminers distribution map. Distribution elsewhere: Widespread in continental Europe including Crete, Croatia, Cyprus, Danish mainland, French mainland, Portuguese mainland and Sweden (Karsholt and van Nieukerken in Fauna Europaea).